It is a truly dependable and spectacular tasting tart so why the animosity you may wonder. Well…I am getting very suspicious that the invitations I am receiving to various dinners and parties are actually an invitation for that little tart of a tart you see there. At first, I was the tart’s biggest fan. I was introduced to it at a lovely cooking school in La Canada, CA called Chez Cherie. Cherie, herself, the lively instructor and energetic entrepreneur, demonstrated it and then proceeded to let us taste it fresh out of the oven. As it baked, we were taunted by the heavenly aroma permeating her store. It was love at first bite if you must know the truth. The slightly sharp gruyere, coupled with the bright and summery sweet tomatoes, all tucked into a flaky crust was almost too much. I could have eaten the whole pie myself if I were there alone, but I wasn’t so we had to share. Later that night, recipes in tow, I was thinking of how soon I could get myself to the nearest Trader Joe’s where Cherie had mentioned they had a lovely box of reasonably priced heirlooms awaiting me. My book club was coming over that weekend and I was dying to make this tart for them. I went to my local Joes the very next day and to my dismay….yes dismay…I almost teared up…there were no heirlooms to be found. I called around to three more Joes and finally found myself driving back to La Canada to their Trader Joe’s where indeed they were awaiting me. Purple, orange, red and yellow…all beauties. They were prettier than any box of gems or bunch of flowers if you ask me. I raced home and made my tart. It was everything I had dreamt of all night. Well it has been almost two years since I first came upon this tomato tart, and I have made it dozens of times by now. Its dance card has been filled up, then started anew and then filled up again. The tart, unlike me, always comes to the party dressed to the nines, in perfect form and gets compliments lavished upon it where ever it goes. Yes, the ugly green monster has taken over—I am jealous of my tart as it so appropriately is named. I guess I am OK for now since it can’t leave the house without me as its chauffeur. I hope you can reign in your tomato tart better than I have! Preheat oven to 400 degrees. Roll the pie dough out large enough to fit the tart pan (or pie pan if that’s what you have), and line the pan with the dough. Poke the dough all over the bottom and sides with the tines of a fork, gently please…don’t take out your aggressions on this lovely tart dough. 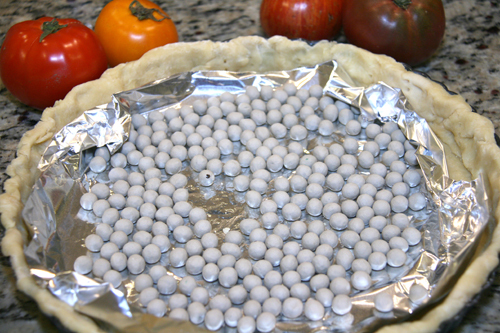 Cover the dough with parchment paper or aluminum foil and place pie weights, raw beans or raw rice inside (to weigh the pastry down). Place the tart pan in the oven and bake 12 minutes. Carefully remove the parchment and weights and return the tart pan to the oven for 8 minutes. Remove from the oven and spread the mustard over the cooked crust. Scatter the grated cheese over the pastry, and arrange the tomato slices on top. Season with salt, pepper and dried thyme or Provencal salt, and return to the oven for 15 minutes, until tomatoes are “relaxed” and tart smells fabulous. Slice in wedges to serve. It’s totally irresistible warm. Who cares if it’s a repost! I haven’t seen this before and it’s GORGEOUS! I know what you mean about the Valentines lights. I’ve been awfully neglectful. Me too…I thought it would be a nice, bright lift to the dreary winter outside around the country. Can’t complain here in sunny CA though. The tart is so yummy!!!! I believe I have had it!! Oldies are definitely goodies!! 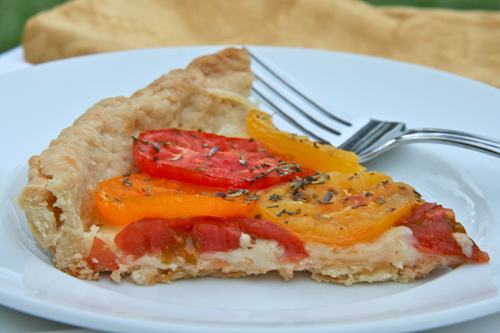 I love tomatoes – what a great tart! the colors of the tomatoes are so pretty! I love the colours on that tart! They look really good. 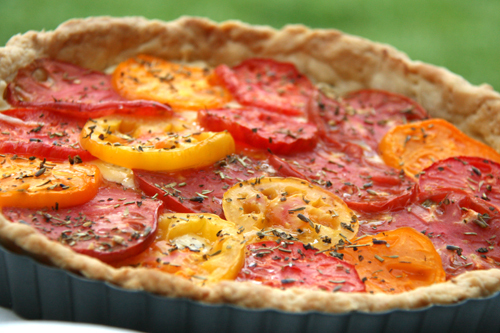 Your tomato tart looks amazing! 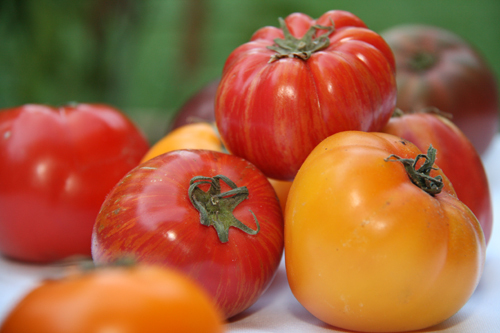 Those heirloom tomatoes are lovely- they almost look too good to eat. I can’t wait for spring so that I can get my garden planted! I’m always happy to stare at something as pretty as this for a while. Can’t wait till summer and fresh tomatoes allow me to make this! That really is a beautiful tart. I’m glad you reposted! wow! now whr can i get heirloom tomatoes in sunny singapore? Tomato tart? I’ve never heard of such a thing, but I’m intrigued by the unusual combination. 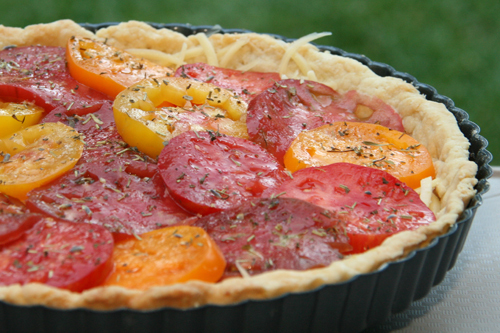 Once heirloom tomato season begins, I’ll be sure to try this out – it looks delicious! Thanks. This looks so yummy and right up my alley. Love the typeface in your header too. Beautiful blog.